Drag and drop vMotion not working with the 5.5 Web Client? A couple of weeks I bumped into this issue where I constantly received a red cross when I wanted to “drag and drop” vMotion a virtual machine using the vSphere 5.5 Web Client. 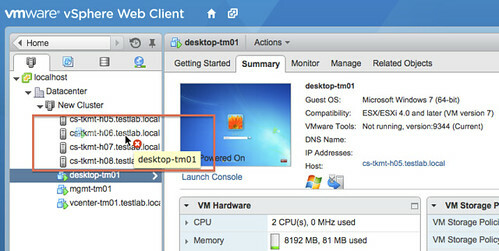 Annoying as it is something which I was waiting for to use as I used this all the time with the vSphere Client. Unfortunately it so happened that I stumbled in to a bug. Apparently when you do a drag and drop migration certain scenarios are filtered out to avoid issues. I guess the filter is too aggressive as today it filters out drag and drop to a host without the use of resource pools. The screenshot shows what this problem looks like in the UI. I filed the bug of course, but unfortunately it was too late for the fix to make it in to the release. The engineering team has told me they are aiming to fix this in the first update release. So consider this an FYI to avoid getting frustrated around not being able to get this drag and drop thingie working. The support team just published a KB article on this matter as well. Hah. Just ran into this. It works with C# client but not Web Client.